RRP £29.99 - This white Fold Down collar dress shirt is manufactured from 35% Cotton 65% Polyester. This allows for minimal shrinkage after washing, enables easy ironing, but also ensures they are very comfortable to wear. The shirts have a pleated box front, covered buttons and adjustable double cuffs. 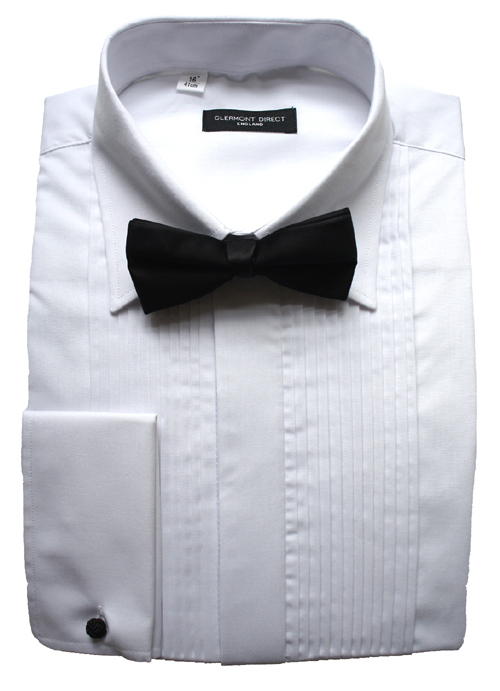 The price includes a free black satin pre-tied bow tie and a free pair of black silk knot cufflinks with each shirt. Shirt Collar Size: Please Select14.5"15"15.5"16"16.5"17"17.5"18"18.5"19"19.5"
This is one of the nicest dress shirts I have seen. Highly R ..